The Minnesota Twins are reshaping their franchise with an injection of youth and prospects. Every Thursday for the rest of the season, FOX Sports North will take a closer look at some specific young players in Minnesota’s farm system — as well as noting others who might be stepping up — measuring, highlighting and evaluating their progress. This is the 15th edition of the 2018 Young Twins Tracker. Notable: Gonsalves subbed in for Nick Anderson, who lasted just 1 2/3 innings against Pawtucket last Friday. It wasn’t a great outing for Gonsalves either, who allowed his first home run since June. Notable: Gordon salvaged a rough week at the plate with a three-hit outburst Wednesday against Toledo. He was held without a hit three times last week, and has gone 21 straight games without an extra-base hit. Notable: Graterol didn’t allow an earned run in his start last Friday, the first time the 19-year-old flamethrower has done that in High-A ball. It’s another encouraging development for Graterol, who didn’t allow a walk for the first time since his promotion. Notable: Kirilloff’s 13-game hit streak came to an end last week, so he immediately set about starting another one, now at six games. He had another solid week, even if .300-ish suddenly seems a little pedestrian by Kirilloff’s usual standards. He doesn’t qualify for the Florida State League leaderboard just yet (minimum 2.7 plate appearances per team game), but beating .301, which currently leads the league, seems like a laughably easy ask at this point. 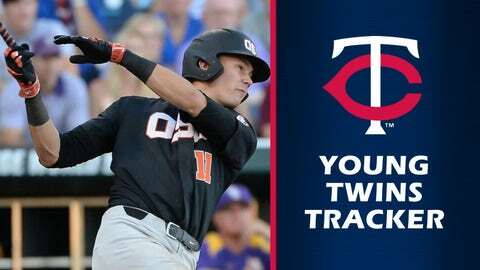 Notable: The Twins’ first-round pick in this year’s draft, Larnach’s run with the Twins’ rookie affiliate lasted just 18 games. He’s off to Low-A Cedar Rapids, where he managed two singles and a double in his Kernels debut. Notable: The No. 1 pick in last year’s draft, Lewis has acclimated quickly after earning a promotion to High-A last month. He had another huge game last week, racking up four hits, two of them home runs, and five RBI on Monday in a win over Lakeland. Notable: Rooker was quiet last week after earning Southern League Player of the Week for July 23-29. He hit two doubles and a home run, but was also held without a hit twice. Other notes: Rochester OF LaMonte Wade is on the seven-day disabled list after suffering a hamstring strain. He’s hitting .250/.376/.378 in 50 games and 164 at-bats in his first Triple-A season. … Elizabethton 1B Chris Williams, the Twins’ eighth-round pick in this year’s draft, leads all players drafted in 2018 with 14 home runs. He’s hitting .260/.378/.565 in 43 games and 154 at-bats. … Chattanooga OF Jaylin Davis hit .556 in five games and 18 at-bats last week, including seven RBI, three doubles and two home runs. … Elizabethton OF Colton Burns hit .538 in four games and 13 at-bats, including three doubles and a home run. … Fort Myers C Caleb Hamilton hit .500 in three games and 10 at-bats. … Chattanooga RHP Tyler Wells pitched four scoreless innings in relief Friday, striking out seven. … Fort Myers RHP Andro Cutura turned in his best start of the season Saturday, allowing just one hit through seven shutout innings.